When faced with the choice of being right or being at peace, we can choose to be at peace by taking the path of forgiveness. When we forgive and are worthy of being forgiven, we are no longer prisoners of our past. Whom do you need to forgive? Make sure you include yourself in the answer. We all need to live with a free, open and loving heart. The Empowerment Process gives you the opportunity to become willing and able to forgive anyone, anywhere, at any time. That means, even if it’s a parent that’s no longer living here on the planet or someone who lives on the other side of the world. Or someone you live with every day, yourself. And, forgiveness can happen right now, if you choose. You can release the past and free your heart. Do you have a name to fill in? Reasons and circumstances don’t matter so you won’t put a condition on why you should or shouldn’t forgive someone. The Empowerment Process shifts your energy so you can make an effective transformation from a rigid or “stuck” place, to forgiveness. The Process allows you to explore your issues so you can acknowledge and accept your feelings, disempowering beliefs, and unfulfilled needs that keep you from easily taking the step to forgive. In this experience, what you’ll discover is that you may be holding on to an energy block that needs to be released. For example, “I was hurt and you are the cause.” Hardened hurt feelings are held as hard knots in the physiology. Our excuses or stories allow us to escape responsibility for that hurt, and we may even blame our discomfort on someone else, often family members. Past circumstances are re-lived, and perpetuated, to our own detriment, if the energy blocks are never released. It’s important to address and transform them before they are so deep that an illness grows out of the disruption to our nervous system. It is the attachment to the old, hurt feelings, and to disempowering beliefs, that somehow justifies your experiences of not being loved, deserving, worthy, or accepted. The bottom line is that it is the torn, hurtful experience in your heart is truly worth repairing so you can enliven relationships with a compassionate heart. 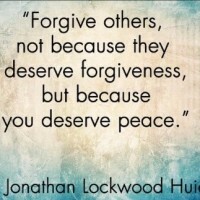 The stories of forgiveness on www.forgivenessproject.com will bring you to tears. If you are an EP practitioner, doing a self-session at the time you are recognizing a heart constriction will help you release your discomfort or pain.